With musical spirit on a high, Day 2 of Nexus’16 flagged off with music in the air with the Indian vocals group competition – Alaap on 4th March 2016. The competition saw participation from 13 teams belonging to various DU colleges among which Geetanjali, Indian music society of Miranda House out shined others by bagging the 1st position followed by Daulat Ram College bagging the 2nd position. Follwed by the Indian Vocals was the Street Dance competition, held in the Audi Lobby, which saw many power packed performances. The crowd went wild with applause as the performers pulled seemingly impossible flips and stunts. The judge Mr. Arjun, from PSD – a street dance project, finally declared Zest from Dayal Singh College as the winners followed by CVS streets team in the 2nd position. However, the range of events lined up at Day 2 didn’t end with this. Day 2 was full of myriad solo events which also included Western Dance (Solo) Competition. More than 25 participants registered who had about five minutes to present their performances. The event was judged by Mr. Shivank Chauhan and Mr. Sanjay Batra, both professors at the college. Manpreet of School of Open Learning as declared the winner while Sanjeevani of Zakir Husain College and Surbhi of Deshbandhu College were declared as the Runner’s Up. 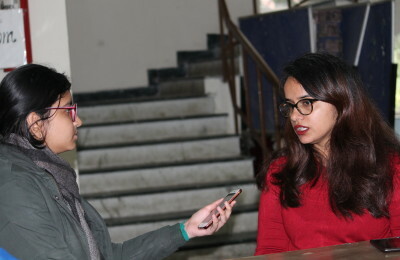 Following the Western Dance (Solo) event was the Western Music (Choir) Competition which saw nine teams participating from all over Delhi University. The event was judged by Mr. Aftab Bose, a graduate from Swarna Bhoomi School of Music. The event was in the Acappella format where teams were given a maximum of 12 minutes to bring forward their presentations. Zephyr, the Western Music Society of Kamala Nehru College bagged the first position followed by the Western Music Society of Lady Shri Ram College for Women at the second position. Zephyr-The Western Music Society of KNC emerged as the winners of the Western vocals group competition at Nexus’16. On the solo event front, Indian Vocal Solo competition, organised by Alaap, witnessed performances by 8 participants, each accompanied by an instrumentalist. The first position, being a tie was won by Bineet Singh (GTBIT) and Saptak Chatterjee(Hansraj College). Likewise, the second position was shared by Swaradhana (DRC) and Saayon (DTU). Among the variety of events, the film making event saw Alex Arthur from SRM University bag the first position while Effulgence from Venky grabbed the second spot. You can catch up the winning entry here. A ‘Duo dance based on theme’ event was held with a total of 7 teams participating from various colleges of Delhi University. Aishwarya and Raghav of Sri Venkateswara college bagged the first position followed by Umesh and Ankita of Satyawati college with the second position. The winning team performed a fusion between Kathak and Bharatnatyam and the event was judged by Mrs. Kodhai Nayarayan, a Bharatnatyam exponent. Day 2 of Nexus drew to a close with a soulful Sufi rendition, with the much awaited performance by the Nizami Khusro Brothers, who energised the audience with popular renditions like Allah Hu, Kun Faya, Kajrare and many more. Sufi night was followed by Razzmataz, the Western dance event, which saw Miranda’s Tanz winning the first spot while Maitreyi’s Zeal was adjudged as the runner up team.